In this review we’re taking a hard look at Lucas Luggage’s Avalon Hardside collection which features a unique hardshell travel design that’s unlike the brands typical lightweight adventure gear – rolling duffels, backpacks, and other low-weight solutions. First though, a little bit of background information for those travelers who aren’t as familiar with the Lucas brand; the Lucas company is known for innovating and introducing the first ever ‘lightweight expandable’ suitcases, and this brand association has led them to direct their research and design crews to find fresh innovative ways for producing lightweight luggage designs. 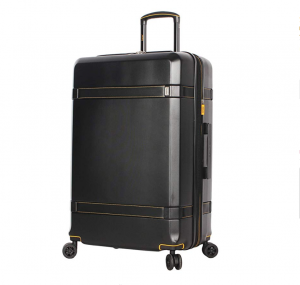 Therefore, as we take a deeper look at this Lucas Avalon collection with a hardshell design and spinner wheels, its safe to say that the Lucas priority will be lightweight travel over everything else. Following somewhat of a standard set approach, the Lucas hardshell bags in the Avalon set comprise three different sizes which can be purchased separately or together (depending on your needs), these sizes include a carry-on at 20 inches and a medium at 24 inches and a large checked bag at 28 inches. For certain select airlines, you may be able to use the medium bag interchangeably as a carry-on, but check with your flight beforehand to avoid any additional travel fees. 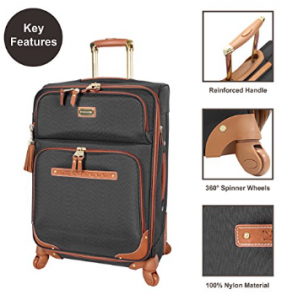 Major design features that are part of the Avalon collection include full expandability for extra space, spinner wheels for functional 360-degeree gliding motion, and a unique dimpled exterior texture which adds to the overall durability of your luggage. 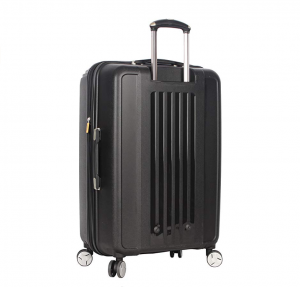 Other similar hard side sets, as you’ll see with Amazon Basics Hardshell Spinner Carry-On, can’t compare because although they’re fairly lightweight they lack that extra texturing which can add to the durability of a hard side suitcase. At 20 inches the Lucas Luggage hard shell carry-on offers 29 liters of packing space, with up to an additional 2-inches or 15% more space when expanded. If you’re a one-suitcase kind of traveler, the carry-on is a great option because it’ll easily fit enough clothing for nearly two weeks of travel. Of course, for those long trips it’s great to have the security of a carry-on as well as the extra space of a checked bag, and so at 24 inches and with added expandability this sets medium bag is also a great option to own with the carry-on or on its own. At its size, the medium bag offers 60 liters of packing space (not expanded). Finally, the large checked bag at 28 inches offers an impressive 84 liters (not expanded) and on its own can easily pack up to 3 weeks of clothing with room to spare. 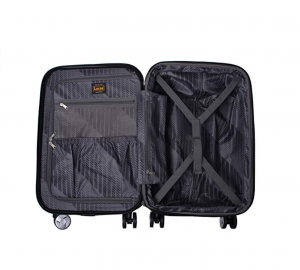 Other storage features for the suitcases in the Avalon collection include a zipper-divided interior, tie-down straps, a mesh zippered pocket for toiletries/etcetera, and a small interior hanging side pouch. Value, or what you define as a ‘valuable suitcase’ should not just come down to the bags price.  Each feature should lend itself to the value of a single suitcase or suitcase set, for instance with suitcases like U.S. Traveler’s 22-inch Lightweight Spinner you get the added value of something as simple as included TSA locks. Likewise, taking a look at the value of these Lucas Luggage hardshell bags there are a lot more features than you’d expect. Each suitcase offers 360-degree spinner wheels for multidirectional comfortable movement in any environment (including crowded airports). 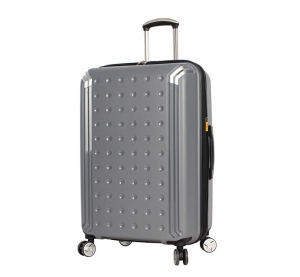 These wheels are paired with an aircraft-grade aluminum telescopic locking handle, and for easy lifting into overhead bins or down from a luggage carousel each bag is equipped with durable top and side haul handles. Added expandability comes from a durable nylon stretch opening for up to 15% more space, and the suitcase includes durable zipper pulls which should make handling bulky packing easier. Interior features offer a watertight inner lining, a divided interior, and two small zippered pockets for added organization. Weight’s come in at 7.1 pounds for the carry-on suitcase, 9 pounds for the medium, and 11 pounds for the large checked suitcase. For Lucas standard’s the carry-on is quite lightweight for a hard-shell design, however the medium and large checked bags are about average weight for unpacked hard-shells. Especially when it comes down to the large 28-inch suitcase, you’ll want to keep it’s 11-pound weight in mind so that you don’t pack it over the imposed 50-pound limit. Overweight luggage will result in an extra charge, so pack as light as you can on your way to your destination and saving the expansion zipper for any extras you bring back from your travels. When in doubt, its always best to fit your carry-on with more clothing/etcetera, than pay additional and often expensive travel fees for an overweight checked suitcase. 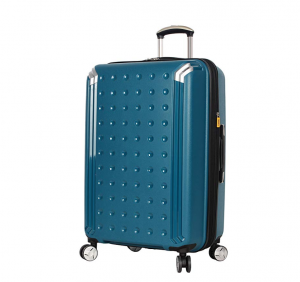 Durability measures include a hard shell body made from a blend of ABS and PC materials which are designed to provide your belongings with maximum protection and are crafted with a unique dimpled exterior texture that adds to the suitcases overall shock absorption. 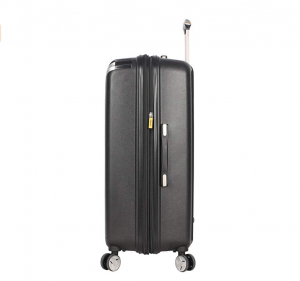 Other durability comes from the spinner wheels which are screwed into the body of the suitcase rather than weakly riveted, as well as an aircraft grade aluminum handle which is extra lightweight and also maintains a high standard for shock absorption. The zippers included with this set are quite strong and include durable zipper pulls, though they are not the self-repairing type like found on Traveler’s Choice’s Rome Collection suitcases. Finally, interior durability includes a watertight inner lining for those times your checked bags are left uncovered on a trolley in the rain, as well as for traveling along wet urban streets. 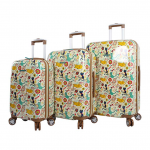 Style options for these suitcases are actually quite extensive and at least for the carry-on include up to 17 different color styles to match your aesthetic. If you’re a business traveler there are some especially unique muted colors as well as simple black faces, or if you’re looking for something a little more unique and eye-popping there are brighter colors like ‘Avalon Peacock’ which are too fun to resist. 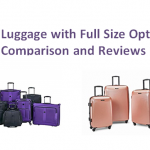 For the 24-inch medium suitcase and 28-inch large, style options appear to be more limited online, however you may be able to request specific colors directly from Lucas Luggage’s website by contacting them. 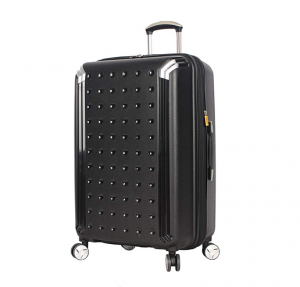 Measuring in at 20 X 13.5 X 9 inches (non-expanded) the smallest suitcase classifies as a carry-on bag and should wheel directly onto the airplane beside you with little trouble. 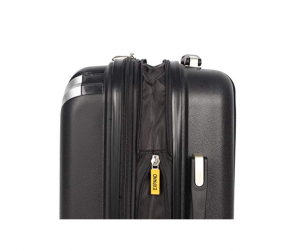 This suitcase has been rigorously tested to meet all standards for fitting into an airline’s overhead bins, and is therefore a great choice for both national and international travels. Next, the medium suitcase which will need to be checked for most flights rather than used as a carry-on, measures in at 27 X 16 X 10.75 inches. Lastly, the large measures 30.5 X 19 X 11.5 inches (expanded) and will certainly need to be checked, so watch how you pack this largest bag if you purchase it or purchase the entire Lucas Luggage hard shell set. All hardside luggage from Lucas Luggage is purchased with the security of a 5-year manufacturer’s warranty. This warranty covers any damage to your suitcase or belongings which are the result of faulty manufacturing, missing parts, or faulty materials. However, the warranty does not cover damages which are the result of a traveler’s negligence or an airlines mishandling. 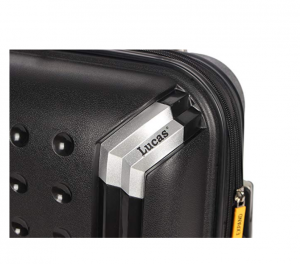 For further details, see Lucas Luggage’s website and contact their warranty services team. ABS + PC blend materials with a dimpled texture for added durability. 5-year manufacturers warranty for all suitcases in this collection. Carry-on is very lightweight and has over 17 different style choices. 24-inch and 28-inch suitcases are heavier than some other hard-shell options. Collection not typically sold together as a 3pc suitcase purchase.